This is my second post. My first post Pretty Pink Posh Watercolour Blog Hop is HERE! It is here finally! All the new stamp sets and dies from Taylored Expressions for the month of June. If you haven’t seen the Taylored Expressions sneak peeks for past three of days, here are the links – Day #1 sneak peek, Day #2 sneak peek and Day #3 sneak peek. All the new products now available for purchase at Taylored Expression shop. Today I am sharing with you one of my cards I made using Taylored Expressions new products. I have used the new Summer Sunnies and Summer Confetti dies to make my shaker card. I have die cut the summer sunnies on a white cardstock panel. Layered the inside with acetate sheet. Then die cut the Summer Sunnies out of black cardstock which I inlaid in its place on the white card stock panel. I die cut the a few Summer Confetti with white cardstock. Then coloured them with copics. On the card base. I coloured and blended yellow copic markers. 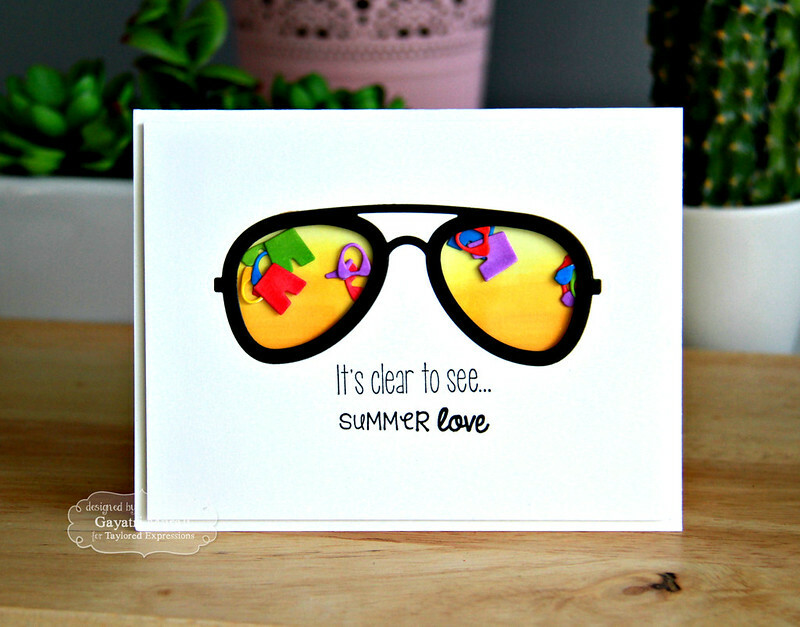 I added foam adhesives around the sunnies, added the coloured Summer Confetti as the shaker bits and adhered to the card base making a shaker card.The sentiment is from Spectacular stamp set and Summer Love stamp set. 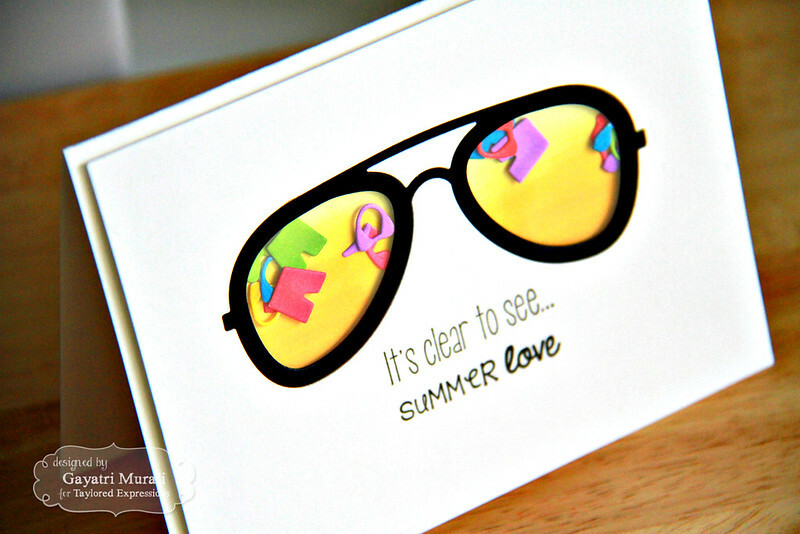 I love the simplicity of the shaker card with focus on the shaker summer sunnies and the sentiment. If you’d like to see more projects and new product information, please head over to the Taylored Expression Blog for a complete list of our participating designers! http://static.inlinkz.com/ppr.js Thanks for visiting my blog today! So cute Gayatri! The inky, sunny lens – so cool! Always spot on, Gayatri. Love the design and bold use of color for your sunny frames =) Nice touch using the frames as shaker. Thank you for the inspiration.